A NUMBER OF politicians have criticised rent control laws following a new report outlining that rents in every county in Ireland rose by 11.3% in the year to September. The latest Daft.ie quarterly report found that the average monthly rent nationwide is €1,334, which is €304 higher per month than at the Celtic Tiger peak. In Dublin, rents are now 36% higher than their previous peak a decade ago, with people now paying €520 more to rent in the capital. Meanwhile, in Limerick city rents were 20.3% higher than a year ago and 19.7% higher in Waterford. Galway saw a somewhat smaller increase of 16.1%, while in Cork, rents rose by 13.7% in the same period. Outside the five main cities, rents rose by an average of 10.6%. 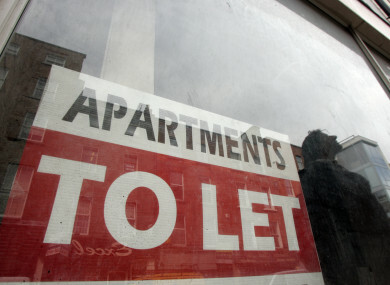 The lowest average rents were found in Leitrim (€577) and Donegal (€628). In light of the reports of continued increased rents across the country, politicians and housing experts have today come out to criticise Ireland’s current rent control laws. Rent Pressure Zone (RPZs) laws were first introduced in December 2016 by then-Housing Minister Simon Coveney to tackle spiralling rents. Under the legislation, annual rent rises were capped at 4% in certain areas. RPZs are located in areas of the country where rents are highest and where households have the greatest difficulty finding affordable accommodation. There are currently five Local Authority areas and 16 Local Electoral Areas which have been designated as Rent Pressure Zones. These can be found here. An analysis of Rent Pressure Zones and what can be done to stop rising rents can be read here. The laws surrounding RPZs have come in for criticism today as a result of the new rental data. Sinn Féin’s housing spokesperson Eoin Ó Broin TD said that the 11.3% annual rise in rent prices across the State demonstrates that RPZs are failing to protect new entrants to the market. It must be noted at this point that, under the current laws, a landlord can evict a tenant and raise the rent above the limits if substantial refurbishment is carried out on the property. Properties within RPZs are also exempt from the 4% restriction if they have not been let at any time in the previous two years. TheJournal.ie has previously reported that there have been multiple warnings and anecdotal reports that landlords are using this clause to evict tenants, carry out minor refurbishments and then charging new tenants significantly higher rents. “Rent Pressure Zones are clearly not working for new entrants to the rental market or people who have to move,” Ó Broin said. The Rent Pressure Zone legislation is failing new entrants to the rental market. Asking for new lets are very clearly circumventing the 4% cap and this is adding to the housing affordability crisis. Ó Broin called for an immediate three-year rent freeze to be introduced, alongside tax reliefs for tenants, as he said “the time for a measured response to this crisis has long passed”. Echoing the words of Ó Broin, Labour’s housing spokesperson Jan O’Sullivan TD said that RPZs are “clearly not working”. “Quite simply, RPZs are not working and must be scrapped. What we need instead is a nationwide control on rents that links them to the cost of living as Labour proposed in a Bill that was voted down by the government more than two years ago,” O’Sullivan said. Similarly, Social Democrats co-leader Catherine Murphy has also said that an emergency rent freeze is the only way to address the rising rent issue. “There is no way that ordinary workers, people with families and young people, can continue to pay rents at these astronomical levels,” Murphy said. In April, Housing Minister Eoghan Murphy announced proposed new measures that would form part of the new Residential Tenancies Bill. Among these is a planned law making it an offence for landlords with properties in RPZs to raise the rent above the legally allowed 4%. “What we’re bringing now is a sanctions regime making it a criminal offence, that we’ll follow with a number of measures that will be allowed to be implemented by the RTB (Residential Tenancies Board) including fines,” Murphy told reporters. At the time, Murphy said that the fine being considered would be in the region of €15,000. Email “'It's clearly not working': TDs hit out at Rent Pressure Zone laws as prices continue to soar”. Feedback on “'It's clearly not working': TDs hit out at Rent Pressure Zone laws as prices continue to soar”.